MR Online | We are the invisible. We are the invincible. We will overcome. We are the invisible. We are the invincible. We will overcome. The mood in Caracas (Venezuela) is sombre. It appears that the attempted coup against the government that began on 23 January is now substantially over (as the Venezuelan Foreign Minister Jorge Arreaza tells me). The Lima Cartel is divided. The Europeans have cold feet. 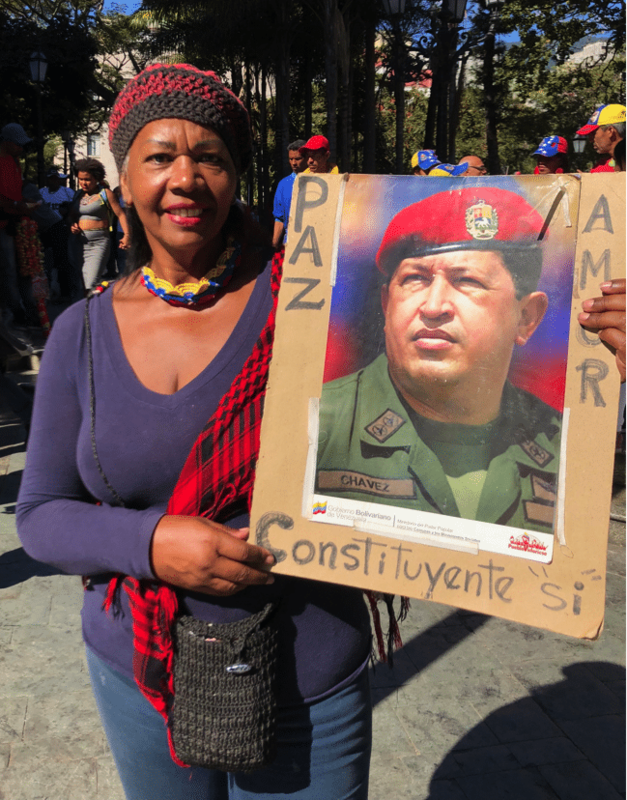 On the one-month anniversary of that attempt, a massive crowd of the poor gathered in the centre of Caracas to demonstrate their support for the Bolivarian Revolution. 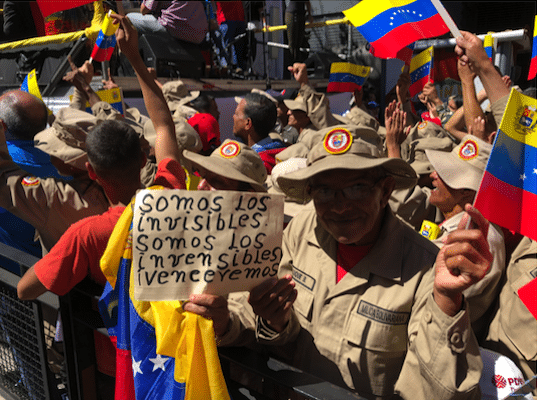 An elderly couple carried a sign which captured the mood–Somos los Invisibles. Somos los Invensibles. Venceremos (We are the Invisible. We are the Invincible. We will Overcome). It is hard to gauge the numbers of people at that rally. A picture from a drone suggests a large crowd, but it misleads. Most crowd counting software assumes a certain body size and a certain amount of space between people in a crowd. Those assumptions do not apply in this case. The supporters of the government and of the Bolivarian Revolution bear the marks of their history on their bodies. They are small and thin, darker skinned and worn by decades of work that has earned them just about enough to survive. The reason why they adore Hugo Chavez–his image everywhere–and why they call themselves Chavistas is that it was the arrival of Chavez in the 1990s that gave them hope and that inspired their political activity. Not for them the accusations that this government–led by Nicolas Maduro–is responsible for their hunger. They know that their Bolivarian Revolution is a process and that they are active in that process. 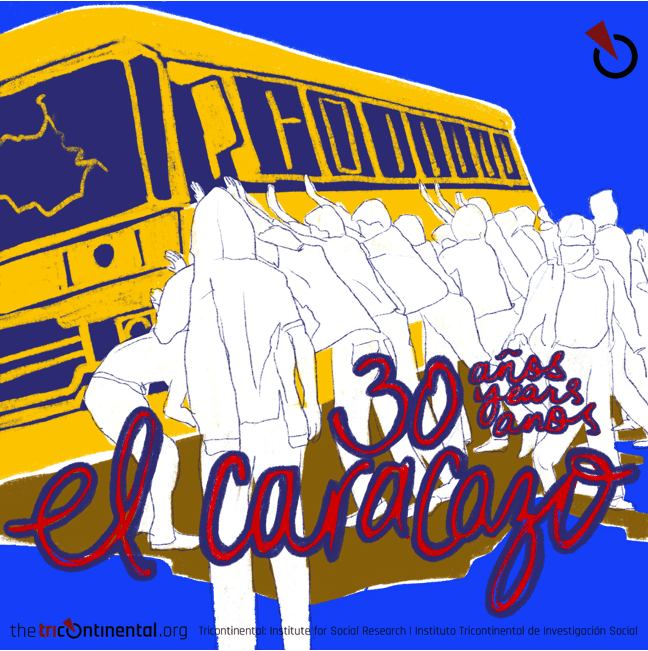 This Wednesday, thirty years ago, thousands of Venezuela’s poor felt maligned by the increase in bus fares. They ran across their country, their rage captured in the disorder they produced. That event is called the Caracazo. It is this event that inaugurates the Bolivarian Revolution. A few days before the anniversary, I visited Mariela Machado, a Black, poor, working-class woman who leads a community in one of the many self-organised housing projects in Caracas. It was the Caracazo and Chavez that gave her the strength to overcome the centuries of disparagement and poverty that weighed on her. She, and her neighbours, had done their best to build a community–with a common kitchen, a bakery, a meeting hall and shared space that is clean and decent. Most of the leaders of such neighbourhoods are women–all are poor, most are workers, many are Afro-Venezuelans. I asked Mariela what would happen to her and her neighbourhood if this government fell. ‘We would be evicted,’ she told me. The fierce defence of the Chavistas against the overthrow of their government is linked to their fear that whatever changes had come in their lives would now be reversed. The old humiliation would return. Even if the attempt to overthrow the government in Caracas is now mostly over, there is fragility in the Venezuelan government. It is a fragility shared with most countries of the tricontinent–of Africa, Asia and Latin America. Public finances across the world have been damaged by the departure of trillions of dollars away from the reach of governments and of productive activity. It is estimated that there is between $21 and $32 trillion in the tax havens. Global financial stock markets toy with over $200 trillion. This is social wealth diverted to unproductive uses. No schools are built with this money. No hospitals are built with this money. Profits on financial investment race to the rich, who have ceased to pay taxation and have ceased to risk their wealth in productive investments. The billionaires are on a tax strike and an investment strike. These two strikes–tax strike and investment strike–are their weapons in the class struggle (as laid out in our first Working Document, In the Ruins of the Present). Because of these strikes and the fragile global commodity chain, almost a billion people cannot find work that sustains them, while those who have work find their humanity broken by their jobs. There is fragility in Venezuela’s reliance upon oil and its lack of food sovereignty. There are some long-term fundamental problems of the Venezuelan economy that long predate the arrival of Chavez and that will continue for some time yet. These are problems common to most countries–such as Nigeria–that have large populations, that rely upon oil exports that finance the imports of just about everything. The vulnerabilities are many. Burkina Faso’s Thomas Sankara would say, ‘he who feeds you, controls you’. It is an important reminder. Talk of increasing food production in Venezuela is important–and urgent (take a quick journey with Ricardo Vaz to Mérida, where the native potato is being rescued). All this will require deeper land reform, but also changes in the culture of consumption that have been produced by the inflow of oil rent. Juan Pablo Pérez Alfonso–one of Venezuela’s great oil ministers–called oil the ‘devil’s excrement’. He remains correct. Over the course of the past week, almost five hundred people from 87 countries representing political groups and movements came to Caracas for the International Assembly of the Peoples–a new initiative that aims to create a platform for solidarity campaigns and to better connect sections of the Left. Reports of the deliberations–which were smart and imperative–made it to no mainstream press. Reporters from People’s Dispatch and ALBA as well as a few other services covered the discussions, which ranged from solidarity for the Venezuelan people to serious consideration of the way money and fake news has subverted electoral democracy. It will take time to digest the implications of these discussions–and it will take time to see what kinds of common actions develop. Certainly, the first common action is to make sure that there is no military intervention in Venezuela and to push for an end to the strangulation of the Venezuelan economy. 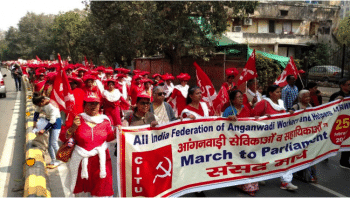 The governments of India and Pakistan are playing with fire. Aerial attacks on each other’s territory threatens to widen the conflict. The majority of Indians and Pakistanis–like the majority of Venezuelans–will not gain from a war. Suffering will be their coin. There are so many real problems that bedevil the countries of South Asia–hunger being one of them. Just before the aircraft fired across the border, hundreds of workers marched to the Indian parliament to demand higher wages and pensions and to prevent the privatisation of the child care centres. They handed over a petition that had 40 million signatures to the government. Vijay Prashad is the Director of Tricontinental: Institute for Social Research, the Chief Editor of LeftWord Books and the Chief Correspondent for Globetrotter.